Place an oven rack in the center of the oven. 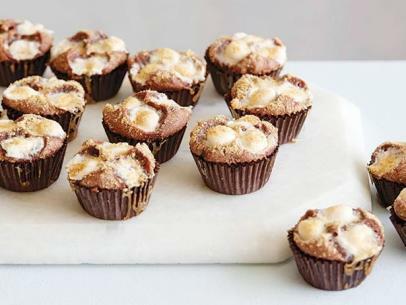 Preheat the oven to 350 degrees F. Line a 24-count mini-muffin pan with paper liners. Heat the butter in a small saucepan over low heat. Remove the pan from the heat and add 3/4 cup of the mini chocolate chips. Stir until the chocolate is melted and the mixture is smooth. Transfer the mixture to a medium bowl. Stir in the sugar, eggs and vanilla. Gradually beat in the flour until the mixture is thick and smooth. Stir in the remaining 1/2 cup mini chocolate chips. Using a small cookie scoop, fill each paper liner with about 2 heaping tablespoons of batter. Push 3 mini marshmallows halfway down into the center of the batter. Sprinkle 1/2 teaspoon of the graham cracker crumbs over the marshmallows. Bake until the marshmallows are puffed and light golden, 10 to 12 minutes. Cool for 20 minutes and serve.